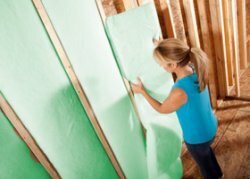 Our guide to Fiberglass Insulation offers detailed descriptions of companies such as Vita Nonwovens and Owens Corning. Producer of high quality non-woven polyester products for residential, medical and automotive use. EnGuard, a glass-free hypoallergenic insulation of recycled and virgin polyester, is a signature product. Made from recycled plastic bottles this insulation is free of VOCs, dust and skin irritants.